Jaipong also has known as Jaipongan is a dance that was created in 1961 by Gugum Gumbira. At that time, when President Sukarno prohibited the playing of rock and roll and other western music played in Indonesia, local artists are challenged to offset the prohibition rule by reviving the traditional arts. He was inspired by folk art, one of which is Ketuk Tilu made aware and know very well the patterns of dance traditions that exist in Kliningan or Bajidoran or Ketuk Tilu. 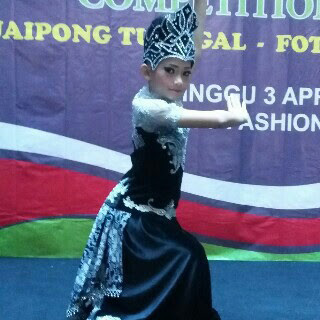 So that he can develop a dance or art that is now known by the name Jaipongan. begin appearing in public in 1974 in the Hong Kong Arts Festival. involving the singer-dancer tati Saleh, Gugum Gumbira as a choreographer, and Nandang Barmaya, a musician and puppeteer. When the government was trying to ban this dance because it feels inclined moral and sensual. But instead of fading, jaipong even more popular, especially in the ’80s. Jaipong dance form when it is no longer presented as a social dance like the dancers, tayub or ketuk tilu dance, in which the dancer position parallel to the spectator, but as a stage dance. Jaipong usually is done by female dancers, but it can also be done in pairs (male and female). this dance more popular and started to increase the frequency of the show both on television, celebration, and celebrations organized by the government or by private companies. 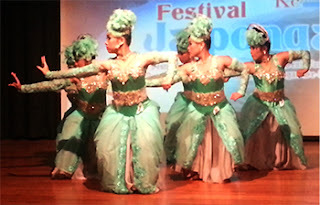 From this dance, born some reliable Jaipongan dancers as Tati Saleh, Yeti Mamat, Eli Somali, and Pepen Dedi Kirniadi. The presence of this dance provides a substantial contribution to the art lovers of dance to more actively exploring the types of folk dances that were previously lacking in the notice. With the advent of this Jaipongan dance, many are making Jaipongan dance courses and frequently used by the businessman to decoy guests invited. Jaipongan traditional dance at this time can be called as one of the typical dances of West Java, visible at important events: the arrival of guests from foreign countries who came to West Java, are always welcome with Jaipongan dance performances. This dance much influence on other arts in West Java, both in the art of wayang (puppets), gamelan music, genjring (the Sundanese musical instrument) and has even collaborated with Modern Dangdut Music (typical Indonesian dancing music).